We design and install drainage solutions for residential and commercial customers, including French drains and surface drains. 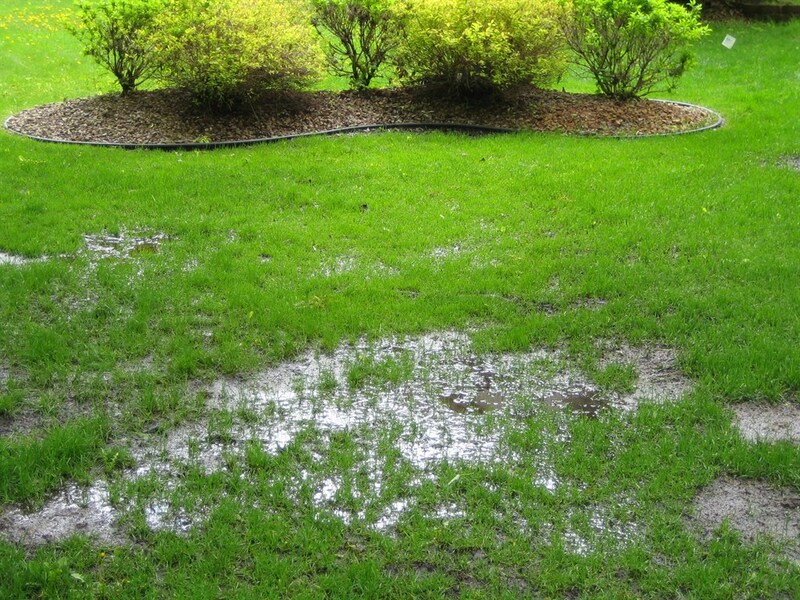 Standing Water - If standing water remains on your lawn 45 minutes after a rainstorm ends, your yard probably has a drainage issue. Poor lawn health - If the lawn seems unhealthy even though its getting regular water and sun, its likely that your yard isn't draining properly. Water Flowing towards House - A drainage problem can result in water from the yard seeping in the home. Wet floors around the doors, water stains in the basement, and cracks in the foundation are some typical symptoms of water intrusion. Most drainage problems result from improper grading. In general, a properly graded yard should slope gently downward from the house and towards the street. Many properties are not properly graded, and water gathers in the yard's low spots. Yard's that were once properly graded can develop problems as the roots of trees and bushes create natural dams by raising the soil. Poorly executed landscaping projects can also alter the grade of the property and create low spots. Named for their inventor, Henry French, French drains are subsurface drainage systems that remove water from waterlogged ground. A French drain consists of a perforated pipe surrounded by gravel and kept free from dirt by landscaping fabric. Water seeps through the earth, gravel, and fabric to enter the pipe through the perforations, and the sloped pipe carries the water to a discharge point. Surface drain systems are made up of several drains installed at the lowest points of the yard. Each drain includes a grill that covers a catch basin with a five- to ten-gallon capacity. Sloped drainpipes with four- or six-inch diameters connect to each catch basin and then lead to either a collections point with an automatic sump pump or a discharge point near the curb. A sump pump is used when the catch basin is lower than the street. A dry well works much like a French drain, but instead of carrying water to a municipal storm drain, the home’s drains and downspouts direct water to a buried storage tank that gradually releases the water back into the groundwater table. Dry wells are a cost-effective eco-friendly alternative to traditional drainage systems.